Anglo-Gallic. Henry VI, AD 1422 to 1453. Silver grand blanc aux ecus. Denomination : Silver grand blanc aux ecus. Mint : Fleur for Saint Lo. Size : 26.6 x 27.8 mm. Weight : 2.99 grams. 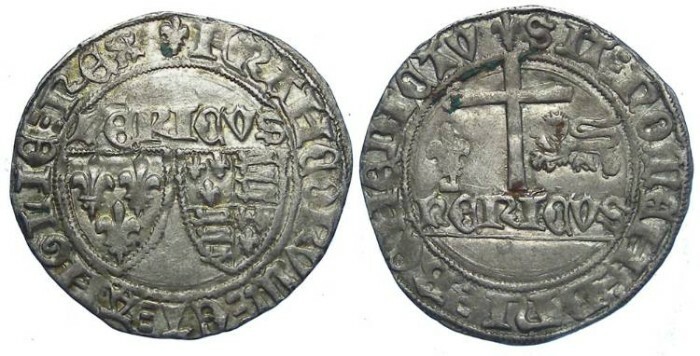 Obverse : Shields of France and England with HERICVS above and FRANCORVM ET ANGLIE REX around. Reverse : Latin cross flanked by a fleur-de-lis and a leopard above HERICVS, with SIT NOMEN DNI BENEDICTV around.